Tarot of the New Vision is an innovative deck that offers a 180 degree rotational view of the original Rider-Waite-Smith deck, providing new context and symbols for the card meanings. For instance, we now see the back of the Magician and a stage monkey is lurking behind him in a comical pose. 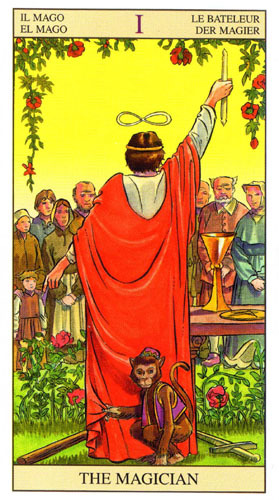 This perspective reminds us that the Magician was depicted in original tarot decks during the Renaissance era as a travelling performer who would entertain or hoodwink to earn his daily bread. It seems the goal of this deck is to elaborate on A.E. Waite's card interpretations by providing refreshing and creative viewpoints to the Waite-Smith deck that has literally dominated the tarot world since its' inception.